Radial head fractures are the fracture of uppermost disc-shaped part of the radius bone which articulates with ulna at its proximal end through the lesser sigmoid notch and with the humerus. This joint is responsible for forearm pronation and supination. Radial head fracture may be isolated just to the radial head or they may be part of a combined complex fracture injury pattern involving the other structures of the elbow, distal humerus, or forearm and wrist. The elbow joint consists of 3 bones and 3 joints. The bones are the distal humerus, proximal ulna, and proximal radius. 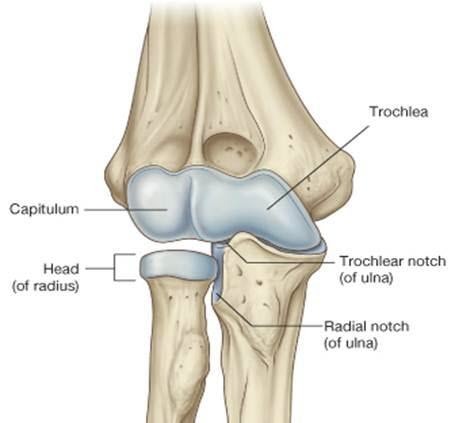 The ulnotrochlear joint is between the olecranon process of the ulna and the medial condyle of the humerus. This joint that allows only flexion/extension. The radiocapitellar joint is between the radial head and the lateral condyle of the humerus. This joint is involved in both flexion and extension and forearm rotation. The radioulnar joint is between the radial head and the proximal ulna. This joint allows forearm rotation. The elbow joint is supported by medial collateral ligament and lateral collateral ligament, radial collateral, lateral ulnohumeral, and accessory collateral. The vast majority of fractures of the radial head are sustained due to a fall onto the outstretched hand. The force is transmitted through the radius to the elbow and the head of the radius is driven against the capitellum. The capitellem thus may also be injured. Sometimes, valgus force to the elbow may result in radial head fracture and is frequently accompanied by a fracture of the olecranon. In these complex injuries, the medial collateral ligament of the elbow is frequently torn. The rupture of the collateral ligament on one side and the fracture of the radial head on the other render the elbow joint completely unstable. Radial head fracture occurs in 20% of cases of elbow trauma, and about 33% of elbow fractures and dislocations include injury to the radial head and/or neck. There would be a history of fall on an outstretched hand or blunt trauma. Patient presents with a localized swelling, tenderness, and decreased motion. The wrist should be examined for the stability of the distal radioulnar joint. Elbow stability needs to be assessed with valgus stress at 30°. A fracture of the head of the radius presents with pain and swelling in the elbow region. There may be associated injuries to the structures in the neighborhood. These include distal humeral region, the upper end of ulna. Radial head fractures are seen in quite a number of elbow dislocations. Combination of radial head fracture, medial collateral ligament injury and coronoid process fracture is known as the terrible triad of the elbow. The diagnosis may be difficult to make on clinical examination. Radiographs are required to confirm the diagnosis. Generally not required for diagnosis but may be needed as part of the preparation for surgery. X-rays in the anteroposterior, lateral, and oblique planes of the elbow are usually sufficient to diagnose the fracture. Mostly, the radial head fracture can be assessed adequately with anteroposterior and lateral views of the elbow. The radial head must be aligned with the capitellum on all views. A radio-capitellar view may be helpful in doubtful cases (minimally or nondisplaced fractures). This view is taken in in neutral rotation & the x-ray tube is angled 45 degrees. Alternatively, modified radial-head capitellum view may be taken to identify undisplaced or minimally displaced fractures. This view is taken with the posterior aspect of the supinated forearm in contact with the cassette and the elbow slightly flexed. The beam is directed 45 degrees mediolaterally. Sometimes, CT scanning of the elbow is used to define fracture patterns. CT scan helps in estimating the fracture size, degree of fragmentation, and displacement and give a better understanding of planning for surgery. CT should be considered if there are associated elbow injuries. The fracture consists of a simple split-wedge fragment which may be displaced or undisplaced. It is also called a chisel fracture. In this fracture pattern, part of the head and neck remain intact. The portion involved in the fracture is tilted and impacted. A severely comminuted fracture. The hallmark of this fracture is that no portion of the head or neck remains in continuity. Fracture of the radial head with dislocation of the elbow joint. Preservation of elbow flexion and extension, supination and pronation are the main goals of the treatment. In fracture-dislocations of the elbow, the preservation of the stability of the elbow joint is another objective. Treatment options include closed fracture reduction with casting or early motion or open reduction with internal fixation, replacement, or resection. Fractures with minimum displacement and angulation are treated with nonoperative treatment. This is done by immobilization in a cast or splint followed by physical therapy. Fixation options include mini fragment plates and screws and Herbert screws. If repair is not possible, excision of comminuted radial head fragments can be considered. If preoperative valgus instability is present medial collateral ligament is repaired. If there is concomitant ipsilateral to the distal radioulnar joint injury [Essex Lopresti fracture], the distal radioulnar joint should be repaired. Replacement surgery should be considered if the fracture is till annular ligament. After surgery, rehabilitation with range-of-motion exercises is begun as soon as the wound is healed. Union usually occurs within 6-8 weeks. These fractures are undisplaced or displacement of the fracture is less than 2 mm. They do not need to be reduced and heal well by conservative treatment. The patient can be treated in a simple arm sling or splint depending upon the soft tissue trauma. Active forearm mobilization followed by physiotherapy helps to restore usually good to excellent function. Some patients might complain about a slight loss of extension. If there is associated elbow dislocation, the elbow should be splinted for a greater period and days, usually 3 weeks. Then limited motion is begun and weekly x-rays should be done to monitor recurrent dislocation or subluxation of the joint. The care should focus on the dislocation rather than radial head fracture. This kind of injury is quite challenging for decision making regarding the treatment. The treatment varies from open reduction and internal fixation to excision. Patient profile and demands, associated injuries of the interosseous ligament or elbow dislocation can affect the decision. Type II fractures that have no mechanical block to elbow motion can be treated similarly to type I. Close follow-up with weekly x-rays is a must. In difficult, a CT scan may be helpful in evaluating the case and executing the decision. The choice is made between excision and open reduction and fixation of the fracture. In high-demand patient, preference should be given to open reduction and internal fixation. In the low-demand patient, excision may be better. In older patients excision should be considered as the bone quality does not favor a good fixation. If the condition of the patient does not permit excision it may as well be delayed. Try should be to preserve the radial head with open reduction and internal fixation when feasible and replace it with a prosthesis only when needed due to technical inability to obtain rigid fixation. These fractures are not repairable. These fractures possess extensive comminution and displacement and early excision and replacement is the treatment of choice. Just excision of the radial head is not advisable as it may result in proximal migration of the radius. Leading to inferior radioulnar joint disturbance with pain and weakness of the wrist. Although excision of the radial head might be contemplated as definitive treatment for a comminuted fracture if such a fracture is in isolation, it cannot be considered an option if the fracture of the radial head is associated with rupture of the ulnar collateral ligament and instability of the elbow joint. Mobilization should be begun early. If the radial head requires excision, repair of the lateral ligament complex is also required. If the radial head cannot be saved and is excised, the potential for redislocation is high. Injury to nerve or vessel generally occurs in severe elbow injuries and is rare in case of isolated radial head fracture. Arterial injury is an acute emergency. Neural injury management would vary with whether the injury is open or close. A severe injury to the elbow can lead to compartment syndrome. The compartment syndrome is an emergency which requires intensive monitoring. Fasciotomy may be required in the cases which do not resolve. Infection can be an early or late and usually requires intravenous antibiotics. Irrigation and debridement may also be required. Management is on the individual basis and depends if a fracture is treated by the closed method or open. It may be due to hardware, intra-articular cartilage injury and posttraumatic arthritis, adhesions, malalignment, or associated nerve or muscle injuries. Nonunion after radial head fracture is usually due to poor biomechanics, poor initial fracture characteristics, soft tissue damage. An open injury or an extensive periosteal stripping predisposes to slow healing. Treatment of nonunion requires internal fixation or radial head excision or replacement. Stiffness is common after elbow injuries, especially if they have been immobilized. Motion is difficult to recover and as far as possible, early mobilization should be initiated. Closed fracture reduction and casting often have associated high rates of stiffness. After radial head fracture a disabling complication because it limits motion, especially rotation of the forearm. Risks include closed head injury, surgical delay longer than 2 weeks, and penetration of the interosseous membrane during surgery by instruments or implants. Treatment by resection with an interposition spacer restores motion in about 50% of patients. Interosseous ligaments shares all the load transferred when the radial head is not present. It might get stretched and may migrate proximally.